What do drones, live streaming, rideshare, and insurance companies have in common? Well, until recently, not much. Now they do however, thanks to a rare mashup of said said tech being spearheaded by a California-based startup called DropIn. InsurTech claims handling has a new player in town. DropIn, Inc. was formed as an on-demand video streaming platform that enables customers to use a network of smartphones and drones. The idea was to develop a live video streaming platform for drones. One that was operated by an army of amateur drone operators, aka droperators, from across the world. Their purpose? To provide video coverage of breaking news stories from war zones and natural disasters. But as with many startups, often times new and unexpected opportunities present themselves. An astute entrepreneur will recognize that, and pounce on the opportunity. 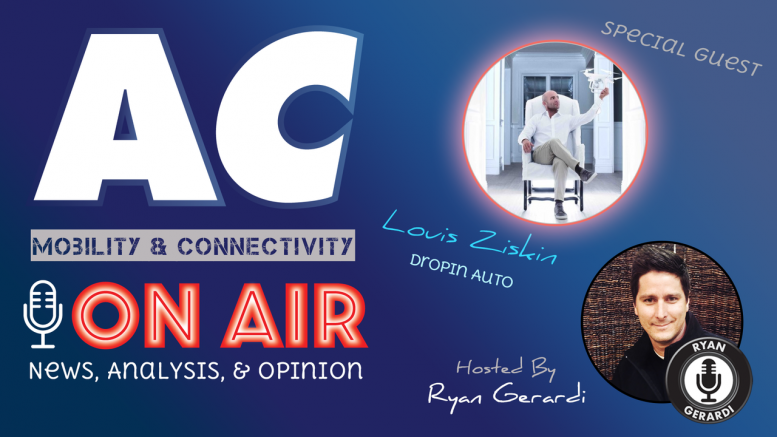 Thus is the case for Louis Ziskin, Founder & CEO of DropIn, Inc., who joined us recently on our live weekly broadcast. DropIn’s recent partnerships with Lyft, Hiscox USA, and Beazley showcase Louis’ genius through the use of these emerging technologies. We’re not just talking about ride sharing, drones, and live streaming video. We are talking about how they are all connected. Live Streaming Drones, Rideshare, and Insurance Companies – the Perfect Combo. When a customer calls about an insurance claim, they are usually in the middle of a crisis. They want to make a claim but they also want to urgently address whatever the situation is. And to do so, insurance companies need to know what’s going on. Asking customers to utilize the insurance company’s app or website can often lead to frustration. Telling the customer it will be a day or so isn’t an ideal scenario either. Enter DropIn. With DropIn’s network of Lyft drivers and droperators, the claims department is able to arrange for drones to live stream real-time video to their adjusters. To make all this possible, DropIn is also working with Lyft to make their drone services even more accessible. The system features a dashboard where droperators can set coordinates and other details to send a local driver to the location. Lyft drivers are then able to stream live video for everything from a spur-of-the-moment plumbing issue to providing quick and efficient service in a crisis. In an auto accident, for example, the system makes it possible for the insurance company to send out an impartial third party to assist, and protect their client. Louis points out that in the case of an auto accident, even when the insurance company is notified instantly, as is often the case with connected fleet vehicles, the company wants to ensure the safety of the insured both physically and legally. Being able to send a Lyft driver over to stream video on behalf of the insured is ideal. It ensures there’s video of the incident, creating clear documentation if needed later in court. It also gives the insured the ability to leave as soon as they can legally without having to stress about finding a ride. Louis even sees a way for the technology to be used to improve local and national news. One use that Louis was enthusiastic but leery of was developing the DropIn technology for general customer use. Opening up the ability to be a droperartor to anyone is attractive, but ultimately, exposing the platform to be used inappropriately. He points out that they had previously offered a general app through the app stores. He shrugs that maybe some other company will run with the idea, but he wants to keep DropIn associated with improving processes, not getting mired up in bad publicity. Ultimately, DropIn isn’t looking to unseat anyone or even disrupt things. If anything, they’re looking to make jobs easier and more efficient. To learn more about DropIn, Inc. visit www.dropininc.com. Be the first to comment on "InsurTech Claims Handling Gets Boost by California Startup DropIn [VIDEO]"